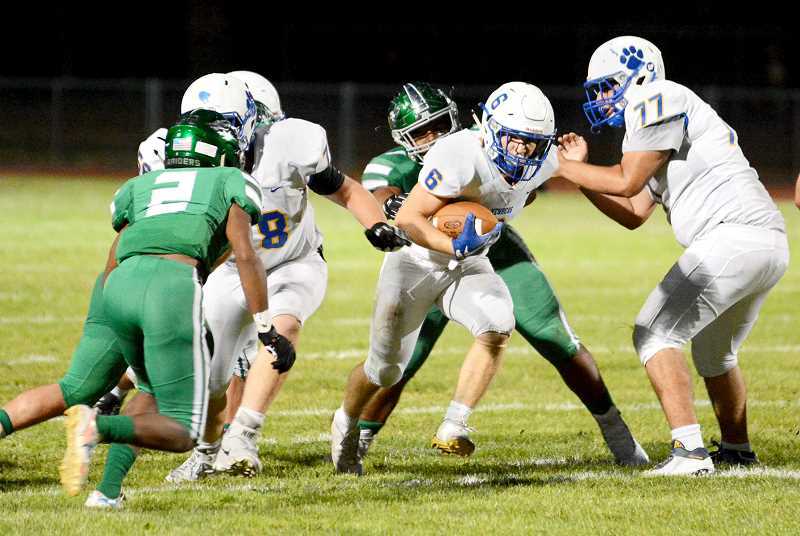 GRESHAM -- Facing a Reynolds team with speed to burn, Newberg coach Kevin Hastin knew the Tigers had little margin for error in the team's final nonconference game of the season Friday night. That was certainly the case on a pair of critical drives in the second quarter that put the Raiders up 14-7 and propelled them to a 28-14 win at Mount Hood Community College. Newberg had a chance to take the lead after venturing into Reynolds territory early in the second quarter, but linebacker Nathaniel Wilson hit Tigers' running back Matthew Larson in the backfield to force a turnover on fourth-and-goal from the 1. "Offensively, we got physically beat up a little bit," Hastin said. "They were more physical than us on that side of the ball. We had the ball on the one-yard line early in the second half and they stopped us on a miscue and that was kind of the turning point in the game. We could've gone up 14-7 at that point. We had a nice drive and just couldn't finish." That missed opportunity proved costly as the Raiders flipped field position and eventually scored late in the second quarter to break the 7-7 deadlock. Reynolds got the ball moving when quarterback Jaden Hawkinson hit running back Nick Haynes on a swing pass for a first down. Several plays later, Hawkinson found Kehdon Fletcher on a throw over the middle. The senior receiver quickly moved past the marker to convert third-and-nine and spun out of a crowd to pick up 10 bonus yards. Running back D'Andre Katz got into the spirit moments later with a rush through the middle that saw him carry the pile an extra five yards to set the Raiders up with first-and-goal. He needed help tucking his shoulder pads back under his jersey on the way back to the huddle. Just when Reynolds was getting close, disaster nearly struck when a high snap sailed over Hawkinson's head. He managed to cover up the loose ball, but now the Raiders were all the way back to the 25-yard line. They would correct the mistake in one play. Hawkinson dumped a short pass into the middle for running back Miles Wilson, who broke loose through the middle for a touchdown and a 14-7 lead at the break. "They had some guys on offense where if you make a mistake, you're not just giving up a first down, you're giving up a touchdown," Hastin said. "The speed they have is nothing we've seen yet this year. We knew that going in, that if we didn't get to our fits, that it could be six points; 90 percent of the night we were getting to our fits, but that 10 percent, they made us pay." Newberg attempted to tie the game shortly after the break, going for it on fourth down from the five yard line. Senior quarterback Gage Wright tried to get around the left side, but Raiders' linebacker Katz sealed the edge and threw him down for no gain. "Their offense is pretty darn good, but I was more impressed with their defense," Hastin said. "They ran around and hit and were physical up front. It was tough for us to move the ball, but we did. We were able to put some nice drives together, we just have to finish." Wilson later scored his third touchdown of the night on a short burst through the middle to put Reynolds up 21-7 at the end of the third quarter. The Raiders (4-1) sealed the victory when Hawkinson zipped a 20-yard strike to Fletcher, who came up with the grab in tight coverage in the end zone for a 28-7 lead. Wilson had a big night on both sides of the ball, piling up 105 all-purpose yards with his three scores. Larson led Newberg with 64 yards rushing on 17 carries, as the Tigers were limited to 155 yards rushing and 221 yards of total offense. The Tigers (2-3) will begin Pacific Conference play Friday with a home game versus Century. "There were no slouches in our preseason and we were in every single game," Hastin said. "The kids are battle tested through preseason and I feel like we've been able to come back after some tough losses and get wins, specifically at home. I'm confident that we're going to bounce back from this loss. I feel like we were a young team going into the season and the growth of our team has been where I want it."